This recipe couldn't have been easier. 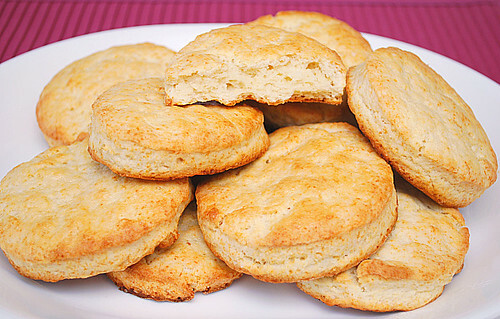 Using only a handful of5 whopping ingredients, making biscuits from scratch is only a few minutes of your time and so well worth it! Seriously, do away with those convenient tubed biscuits from the store and give these a try. What I loved about this recipe (aside from the ease) is that they came out wonderfully fluffy, soft and flavorful. The recipe allows you to be creative and add additional ingredients like cheese, fresh herbs, etc to make them even more flavorful. If you're a purist, make them as is and serve them up with a compound butter. I made these as is and served them with honey butter to go perfectly with my fried chicken dinner... outstanding! Thanks to Melissa for selecting this week's TWD baking challenge. Hopefully others who tried this recipe had better luck that me or liked it more than my husband. Please check out Melissa's blog for the detailed recipe and be sure to take a peek at fellow TWD's to see how their recipe came out! Oh yes, love honey with my biscuits but honey butter?? That's even better.